1. 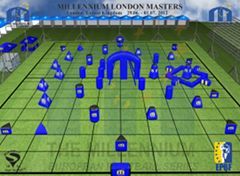 Millennium pro series 44 bunkers blue/black colors printed Millennium logo in Yellow. 2. 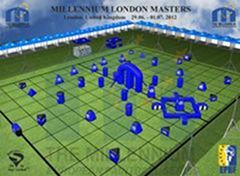 Millennium pro series 44 bunkers blue colors printed Dye logo in white. 3. Millennium pro series 44 bunkers red/black colors printed MAXS logo in Black. 4. Millennium Tournament 44 bunkers red/black colors printed GISportz logo in Black. (no water Bladder).